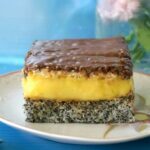 Poppy Seed Cake with Custard Filling and Nutella, a fabulous dessert that can be the star of any party. It might look posh, but it’s super simple to make. This is what I call perfection! Forget about ready-made cakes that cost a fortune, this is the mother of all cakes! And 100% homemade with little effort and simple ingredients. Does it sound too good to be true? Well, it is true, take my word for it. 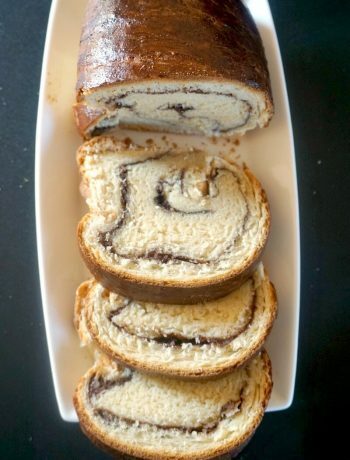 It’s actually a favourite of mum’s, she makes it pretty often, so I had to take advantage of my holiday in Romania and get to bake some yummy stuff with her. So, what is the secret to these perfect layers of deliciousness? How do you make poppy seed sponge? It might look complicated, but trust me, it’s not. Firstly, get your sponge ready, then pop it in the oven, and while this is baking, you can get the vanilla custard ready. bake at 180 degrees C (360 Fahreneheit) for about 20 minutes or until a tooth pick insterted in the middle of the sponge comes out clean. How do you make homemade custard? It’s super simple, fail-proof, and better than any store-bought version. 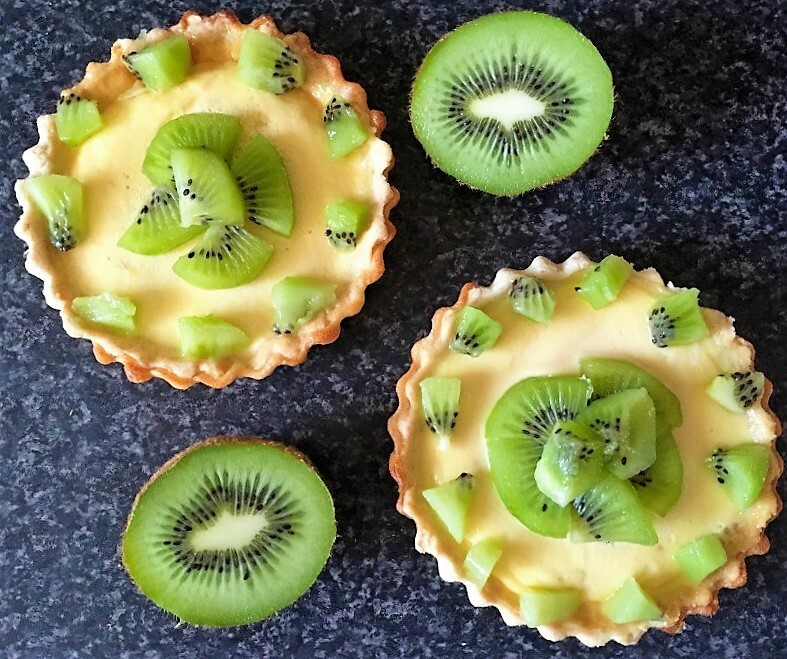 NEVER EVER buy those sachets of pudding powder or whatever, you can make your own custard with fresh ingredients so easily. You don’t even need to wait for the sponge and custard to fully cool down, you can assemble the cake while they are still warm. Top the sponge with the custard, arrange the crackers over, then top with nutella. The biscuit/cracker layer can be optional, but I find that it helps spread the nutella easier, rather than to spread the layer of nutella over the custard. No mess, and you can also cut some pretty decent slices of cake once it settles. Just make sure you leave the cake to settle for a couple of hours in the fridge after you assemble it, it tastes even better when it’s cold, and plus you get better layers when you slice it. Make sure you use a sharp knife to cut it, and that you clean it often while you slice, the nutella and the custard tend to stick to the knife a bit. But that’s pretty much all, then what’s left is some seriously delicious cake for everyone to enjoy. If you like custard, why not try my fabulous Portuguese Pastéis de Nata Recipe (Portuguese Custard Tarts)? 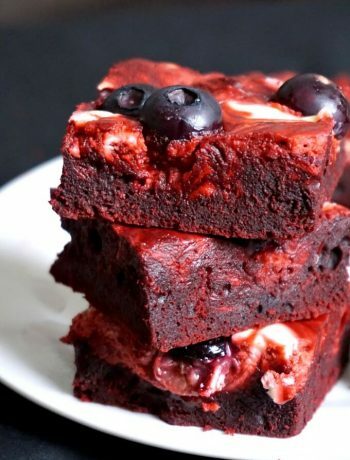 Easy to make and super yummy too. If you’ve tried my POPPY SEED CAKE WITH CUSTARD FILLING AND NUTELLA or any other recipe on the blog then don’t forget to rate the recipe and let me know how you got on in the comments below, I love hearing from you! You can also FOLLOW ME on FACEBOOK, and PINTEREST to see more delicious food and what I’m getting up to. 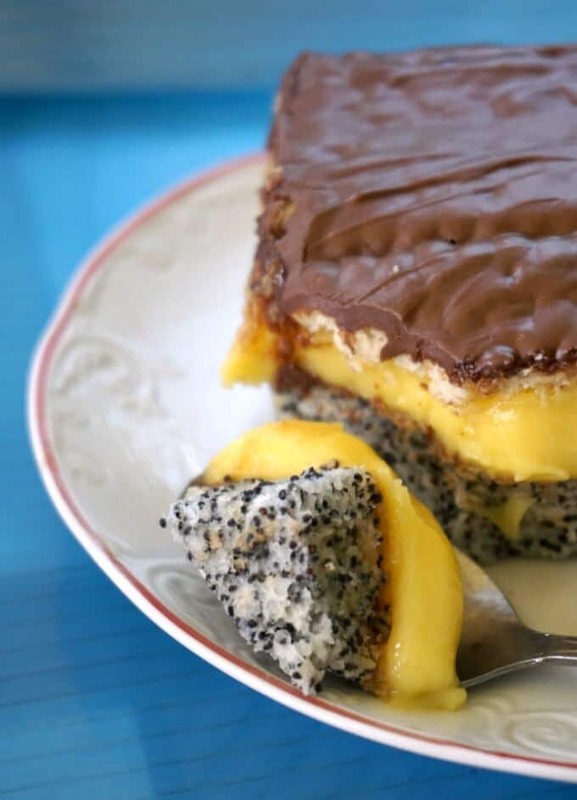 Poppy Seed Cake with Custard Filling and Nutella, a fabulous dessert that can be the star of any party. It might look posh, but it's super simple to make. This is what I call perfection! To make the poppy seed sponge, pre-heat the oven to 180 degrees Celsius (350 Fahrenheit). Beat the egg whites with a pinch of salt until they form stiff peaks. Add the sugar and continue to beat for a further 2-3 minutes, until you you get a meringue-like consistency. Add the vanilla extract, baking powder, flour and poppy seeds, and mix again to combine. 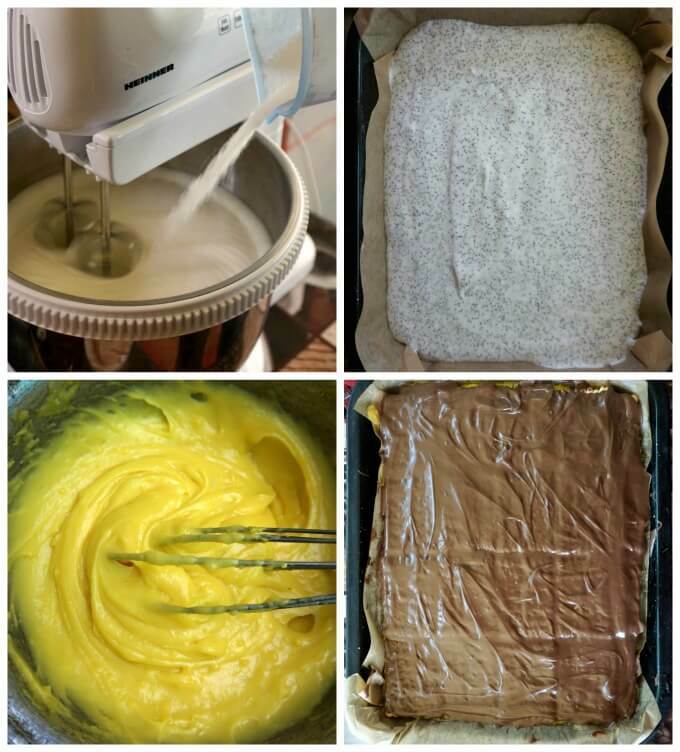 Line a rectangle baking tray (25x28 cm or 9x11 inches) with perchament paper, then spread the poppy seed mixture into a layer, and bake for about 20 minutes until a tooth pick insterted in the middle of the sponge comes out clean. To make the vanilla custard, beat the egg yolks with the sugar until you get a smooth consistency, then add the flour and vanilla extract. Pour the milk into a pan, and set it over a medium heat. Add the egg mixture to the milk, and whisk for about 5 minutes or until smooth and creamy. Leave to cool for 5 minutes, and add the butter cubed and mix well until fully incorporated. 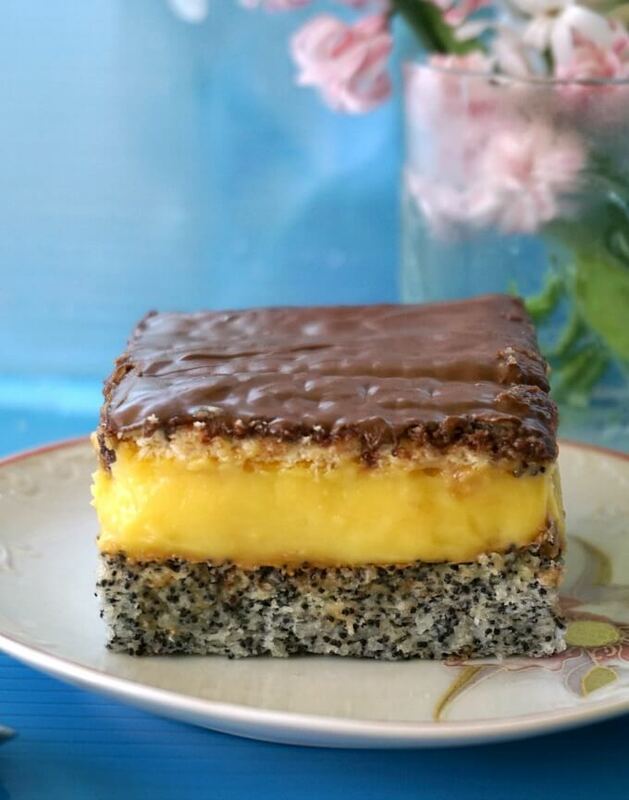 Spread the custard over the poppy seed sponge, then add a layer of biscuits/crackers over the custard, and then top with the nutella. Please see the post for more tips about making the cake. Hi daniela, thanks for the recipe, I loved the custard but I think 1 tablespoon of baking powder was way too much for how the sponge cake turned out. Also, if you live in the UK, where do you get your Graham crackers, as these are American? And I can’t find them anywhere. Hi Mel! Thank you for your message! You can use less baking powder, down to a teaspoon if you like, especially if you use self-raising flour rather than plain flour. The reason I mentioned Graham crackers is because, although I live in the UK, most of my traffic comes from the USA, so I always mention other options for my US readers too. If you live in the UK, you can try using the malted biscuits as well, I think they are a better option that the digestive biscuits. I personally live the rich tea biscuits, but of course, we all have different tastes. Let me know if that helps! Thank you!